With less than a week to go before the European transfer window closes events are starting to accelerate as Hammers iron out their policy with regards to their strikers, ironically most fans assumed that Marko Arnoutovic will be the big name departure from the club during this window, however it appears nothing can be further from the truth. Word coming out from the Rush Green training camp is that 'Arnie' has knuckled down to training having had a 'clear the air, heart to heart with Manuel Pellegrini. It is understood that Arnoutovic has accepted Pelle's word that the Austrian striker will be allowed to leave the club at the end of the season unless an offer that meets the club's valuation arrives, the player who doesn't want to stay is Javier Hernandez. With all the fuss about Arnoutovic, Chicharito's actions seem to have gone unnoticed, if 'Arnie' had agreed terms with another club ahead of a transfer there would have been all hell to pay but Hernandez's 'agreement' with Spanish club Valencia is common knowledge. The fact that Hernandez is prepared to take a pay cut is widely seen as a firm indication that he will be on his way sooner rather than later, Manuel Pellegrini would prefer to keep him at the club but by freeing up the player's massive wage could generate the funds he needs to bring in another striker. Hammers are highly unlikely to recoup the fee they paid Bayer Leverkusen or anywhere near it, Hernandez's main sutors and the club he has a 'pre-deal' with Valencia wanted to take him on loan initially, but that offer was firmly refused by West Ham. However according to Spanish media outlets including the generally reliable La Marca, Valencia have upped the ante by making a firm offer to take Hernandez on a permanent basis. There is a bit of a problem though, because Valencia's offer is only €8 Million whereas Hammers are demanding €12-14 Million, and any hopes of a 'bidding war' between Valencia and Monaco, who were also interested in the player, have evaporated due to manager Thierry Henri's sacking. It is not only Chicharito standing next to the revolving door, Andy Carroll is also in the last gasp saloon however in his case there is a rumour that the club are going to see if the impossible happens, ie that Carroll stays fit, if that was the case the club would activate the two year option they have, and then sell him on recouping a least a small amount of the huge money he has cost the club. Is how all this distresses other players so much they find it impossible to perform because of it...what a load of bo**ox.....what they are really saying is the other players are jealous and angry with there agents for not getting them that kind of move....he does not play its an opportunity for someone else to shine...he thinks he is too good for us and his team mates well screw him he is just one player so stop using him as an excuse we the fans support whoever pulls the claret n blue on so put the effort in and show him you no what we wont miss you as much as you will us. If we do get this Gomez,why are we loaning him back,sounds crazy,we ain't man ci££y. LOL... Charlie is me darling! Glad we never got him in the panic days! 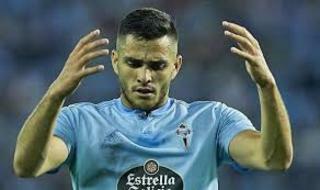 I really hope the Maxi deal goes through, I think the guy has talent and allowing him back with Celta is great business. We keep the Incredible Sulk until the end of the season with something to play for in the Chinese window and start a fresh with a REAL young striker joining us without the gambling habit of Sulky chops! We are not in the usual panic mode of potential relegation and as you say Mcbikeman we prevent the Gazumping seen in the past with likes of Lacagoals, Batshite etc etc thanks to billy big shoes Arse and Chavski pipping us to the post! Pelligrini is doing what he did at Man City. Building a very decent team during his first season while looking ahead to next season. If we wanted him now he would need a month or two maybe three to adapt (Felipe Anderson) so good dealing if it comes off! Thanks for clearing that up lads. what club in their right mind would want to buy ANY of that pile of shite who played tonight??? Ogbonna, Obiang, Carroll....could be bought with three books of Green Shield stamps....and we’d get a toaster in exchange!